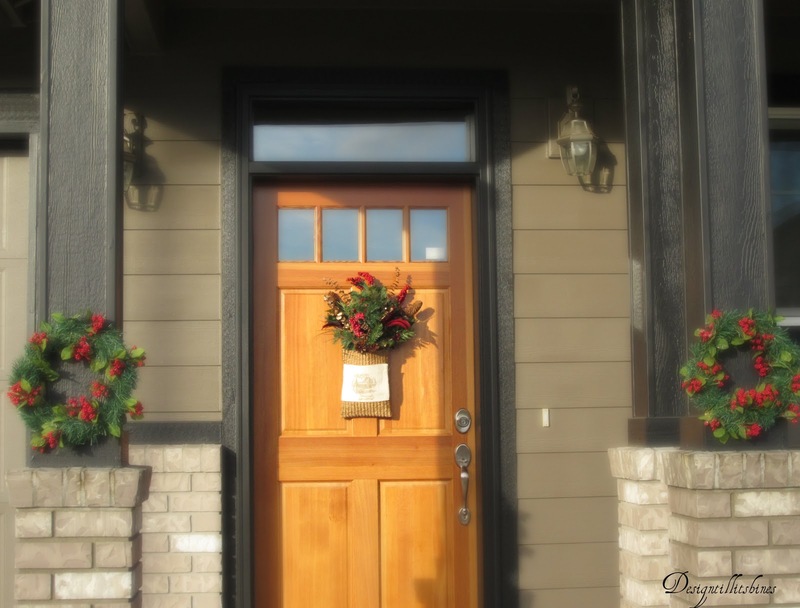 I love all the pretty wreaths on front doors this Christmas but I decided to do something different. I've always liked door baskets but they are hard to find around here. None of our craft stores carry them and I didn't want to keep looking or order online, so I thought I would try to make one on my own. I knew I wanted to do a simple display this year so I looked around for something I could turn into a door basket. 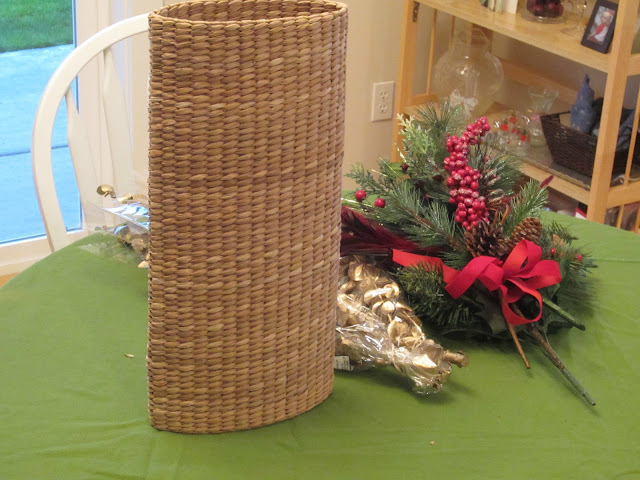 I came across this long tube like basket made out of seagrass in a thrift store. I don't know what you would do with this, except maybe put it around a pillar or something for decoration. 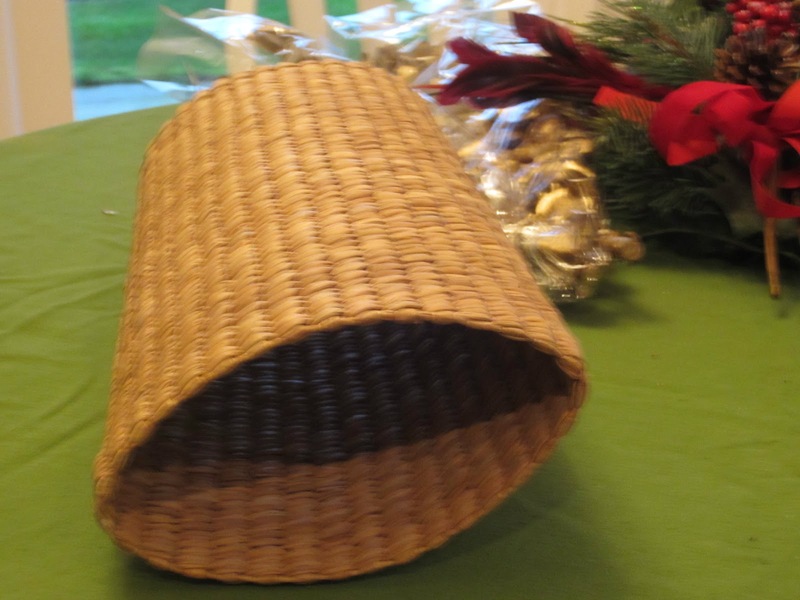 It is really flexible and open on both ends and I thought if I could flatten it and sew it at the bottom I would have a basket I could use. I gathered together some christmas bushes that I wanted to use inside of it and cut off about 4 inches off the top of the basket since it was too tall. 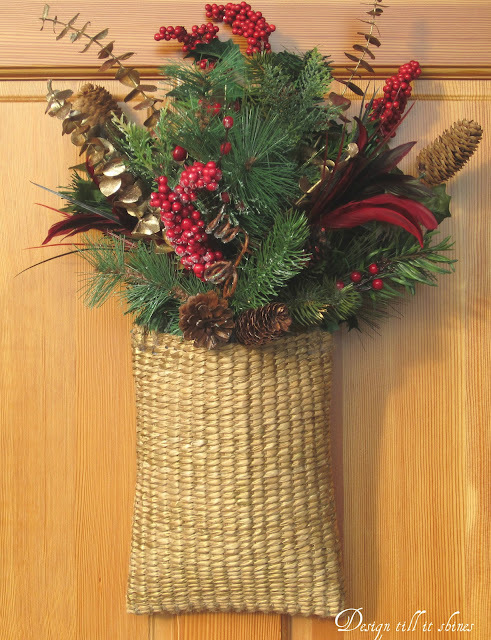 I used some jute as thread and stiched the bottom of the basket closed and added gold paint. I was a little short on time so I used one of my victorian house stamps on some canvas and attached it to the front. I love this stamp but I'm not sure that this looks the best on this basket. So I might try something else on it or just leave it plain. I softened this image and bit and I added two small wreaths to the pillars. I just wrapped some garland around each wreath. I decided to stay with a red and green color theme. 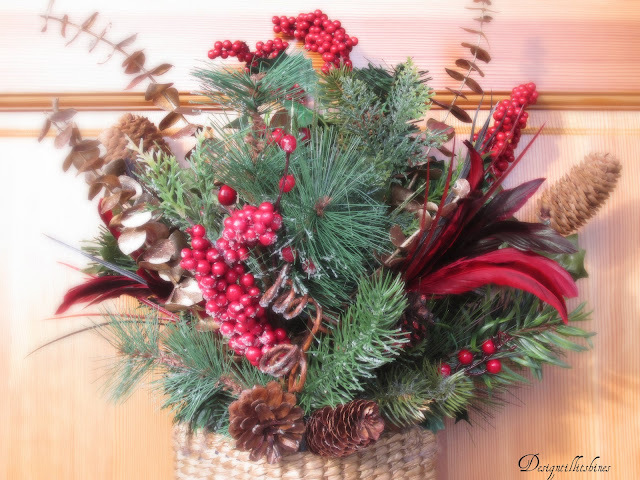 Just something simple and pretty for the front door to help get into the Christmas spirit! Thanks for stopping by. Comments are always appreciated! I love the basket on the door--it looks great! So nice of you to stop in for a visit again! Thanks for the comment. You know what I like? 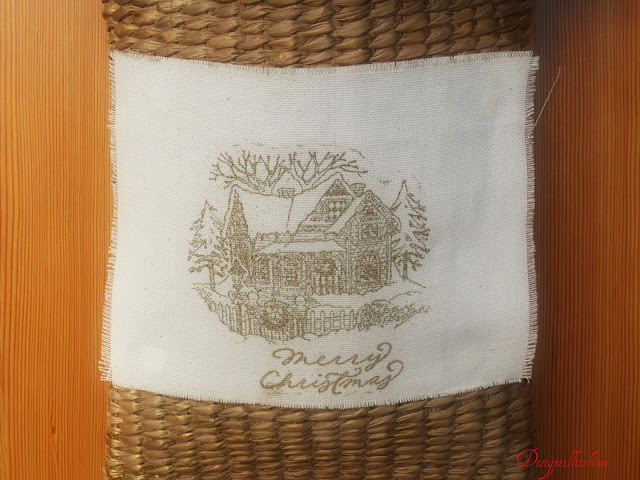 After Christmas, you can remove the stamped fabric and leave it up the rest of winter! PS Can you use the part you cut off to make a bow? I can't really use the part I cut off for anything else. I am thinking of adding something decorative to the front of the basket. Thanks for stopping by. 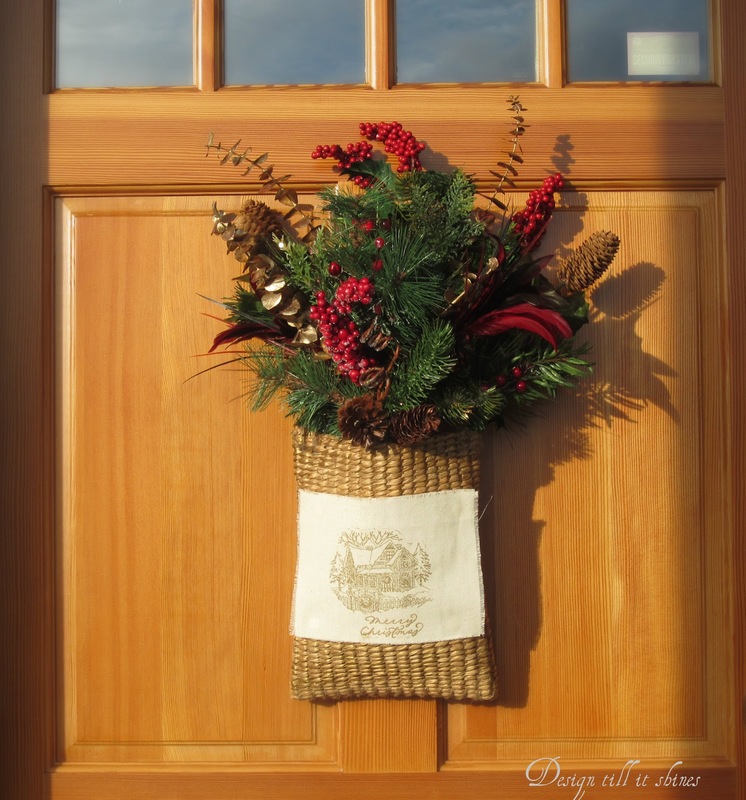 I like your idea of using a basket on your front door to welcome the holiday season. You are right about not being able to find door baskets. I've looked too in the past and had to settle on doing something else. Yours turned out really nice, Diane! Thanks for stopping by and leaving such a nice comment Gail! I was lucky they had something at the thrift store that I could use. Thanks so much for sharing your Christmas Door Basket at Simple & Sweet Fridays. I love how you put everything together and I love the stamp on it too! Just perfect. New Follower! Have A Happy Holiday Week! what a nice little basket - made extra special my your linen addition! So pretty! I love the basket on the door. Thank you so much for sharing at A Bouquet of Talent!